Here they are! I’m loving how these shorts fit and feel. I think I finally have the right amount of waist ease so that I am comfortable sitting, crouching down and playing on the floor with my kids. Yes, same tights. I love these tights. Need more. And more colors. All the colors. 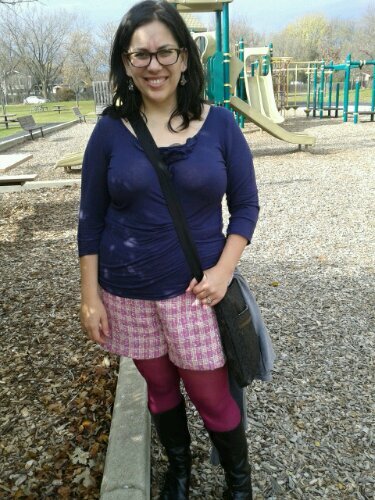 I had hubby take this pic when we were at the playground with the kids. I’m also giving you a sneak peak of my Two Zip Hipster (click to go to the pattern). I love this bag. I had forgotten that one of my favorite bags when I was traveling in Australia (4 months, yo) was a zippered hipster. I’m re-living the fond memories. Anyone else enjoy sewing with suitings? I absolutely love them. All kinds. Any fabrics you want to experiment with? Thanks. That’s what happened to me with this boucle. I totally thought it would be a short jacket. Can’t wait to see what you make. Suitings are my absolute favourite fabrics to work with. They’re forgiving and feel so nice and the end result is always great. I have no courage to show my gams, even covered in pretty tights, so you go girl! Hehe. I thought I was going to make these shorts longer but then they started to look less and less like vintage beauties and more like a frumpy mistake. 🙂 I totally agree that suiting are super awesome. You seriously can rock pink and purple (or magenta and eggplant.) Seriously awesome. Lovely shorts and perfect tights to match! You should check out http://www.mytights.com/ they have an ammmmazing selection. I don’t know many people that use the term “gams” but it does bring a giggle! I don’t, either, which is probably why it makes me laugh, too. Might I add that when I saw house avatar I both panicked and was really excited. Love Dexter.